The blades from the engines slow to a grind as the aircraft enters its allocated gate. I peer through the window to discover a thick early morning haze. Any chance of discovering this mysterious landscape – impossible. The thought of working through another night hasn’t dampened my spirits: though my body is fighting the lack of sleep. We have just landed in the once colonial capital of Kolkata. The spell of India soon comes upon me as the crew bus navigates through mild congestion, giving us an express route to the hotel. The once impenetrable haze blanketing the cityscape lifts slightly, exposing the rich colors and disorder that make this country famous. After what feels like eternity, it’s a relief to finally strip from my uniform, take a soothing shower and gather my possessions. After a few moments, I find myself reliving an all-too-familiar plot: standing outside an unknown hotel in a strange city, armed only with a map supplied by the concierge and a sense of carefree adventure. An Indian taxi driver screeches to a halt right before my feet. We negotiate a price and a final destination. As I open the door, I find myself sitting in the “ambassador”: yet nothing could be further from the name. A wreck of a car that should have been scrapped years ago, its interior so completely worn that a random spring protrudes from the passenger seat. Its engine struggles to find any remnant of horsepower. My driver clearly puts all his faith in the numerous Hindu figurines that are glued to the top of the dashboard as he wrestles this unyielding machine through the choked traffic. Gazing through the open window, the chaos of Kolkata comes to life as we enter the city center: speeding cars stuck in a sea of rickshaws, markets spewed from the curbs. 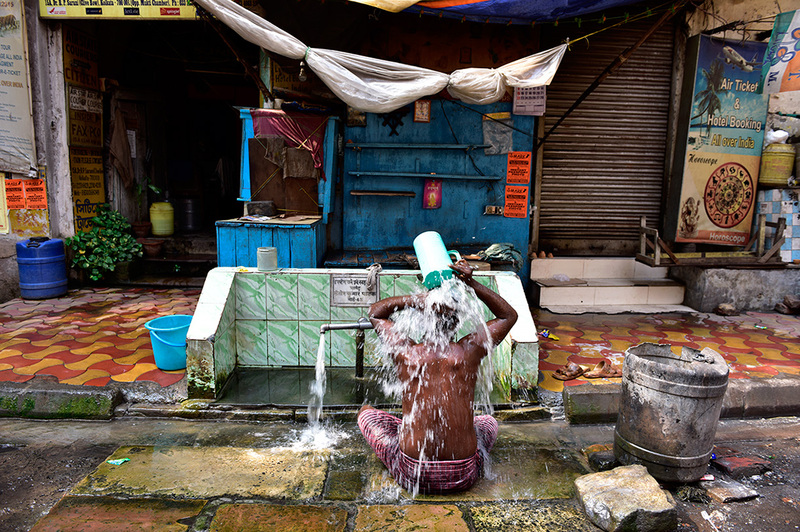 People showering from exposed wells. The sight of this heavy population and crumbling infrastructure captures an amazing kaleidoscopic of liveliness and energy. I summon the driver to stop and soon too become immersed in this mayhem. Cutting through the deep streets, I arrive under one of the main bridges where lies a flower market. A hive of activity, this location is a raw, uncensored impression of street life. In these crowded passages, numerous vendors are scattered, guarding giant mounts of orange and yellow garlands. I notice yesterday’s newspaper sprawled on the dirty ground, acting as a temporary liner to preserve the fragile merchandise. During these frenzied trades porters dodge around people to deliver and collect immense loads for awaiting trucks. Exiting the market, the labyrinth of streets unlock even more opportunities for exploration. I decide to leave the map in my back pocket and allow myself to be transported by the mayhem for a while. I soon become immersed into a scene that defies my sense of western logic: smokers walk past open drums of oil as a tanker unloads it contents. Speeding trucks barely scraping through narrow passages as feral kids roam freely along the curbs. Pretty soon, this mass of people and disorder become too overwhelming. A bout of fatigue gets the better of me, I decide to find another taxi, retire back to the comfort of the hotel, and leave India to its daily grind.